Depending upon your business, you may use a multitude of web services to keep things running smoothly. One for invoicing, another for project management, yet another for time tracking, contacts, support, etc… Even if you can get them to integrate at some level, managing all of your information in multiple apps can be a challenge. It’s a bold claim and while I don’t necessarily believe that to be the case, there is a compelling argument to be made for consolidating everything into one place, including a consistent look and feel, reduced training times, and cost consolidation. As mentioned, WORKetc is an upgrade and refresh of an existing service called Veetro, and along with the name change comes a significant interface update. I recall evaluating Veetro in the past and finding the interface lacking, but this new version 2.0 brightens things up considerably and adds improved navigation and lots of obligatory AJAX to make things easier to use. WORKetc does take an everything but the kitchen sink approach to this suite, integrating time sheets, project management, billing, help desk, task management, CRM, and more all together into one application. The fear with this sort of approach is that the individual apps might not stand up to their standalone counterparts but I certainly didn’t feel that I was using a “lite” version of anything. Features vary even in standalones and in most instances I found that the individual WORKetc apps are really quite feature rich. In working with the app for even a short time, the advantages of consolidation become apparent. Time and tasks are logged against clients and projects, and are automatically figured when billing time comes along. In fact, the linking of just about any activity to another works really well and provides for amazing flexibility. Screens are clear and information is presented well. Tags are everywhere for easy categorizing and the dashboard and reporting options are plentiful and provide some insight into all of the data you are collecting. The service can be opened up to your clients who can be given access to log support tickets and check on their invoices, but a glaring omission is their inability for them to interface with the project management portion of the app. This is a real shame and I imagine it might be a deal breaker for some – unfortunately it is for me. It was mentioned to me that this is a planned feature but no time line was given. I found the online help to be good, albeit a bit sparse, but my support request was answered almost immediately. Version 2.0 is light years ahead of Veetro in usability and overall I am really impressed with the breadth of functionality that is built into WORKetc.. If you’re starting from scratch I would certainly glance over the tour and features. I think with just a little more polish, and a client facing Project Management module, it really might be a contender to replace the standalone apps for a lot of small businesses. I’ll certainly be watching it closely. Monthly subscriptions start at $29.95 for a single employee, $44.95 for two employees, and $10 additional for each employee above the first two. There is no free trial available but there is a 14 day guarantee if you subscribe and the product doesn’t meet your needs. More information can be found on their sign up page. Would you give up your standalone for an integrated suite? Are single purpose web apps really dead? WORKetc seems to have gone big changes lately. Most of above points are now settled. Would definitely give it another shot. Thanks Dan, for wonderful piece of software. Hi Paul – please contact me over at http://www.WORKetc.com and ask for me on support. We have most of what you want in place. Anjay – WORKetc has an export function that allows you to download all your data as CSV files, as well invoicing into Quicken. Worketc does not seem to have option for user backup / export to some database. I am with Angela on this one. If the tool sub set that would allow clients to login is added I am there. I will drop everything else I use and go with this. I would just like my clients to see the on going progress, leave messages, upload files and see their invoices. To have this in one place would be bliss! I would love to know a time frame on when this could be implemented. 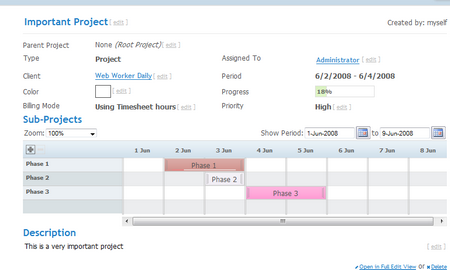 As I outlined above, we are still working on tool sub set that would allow clients to log in and view their projects. The issue we have come up against is that every WORKetc customers wants to only allow their clients to see certain aspects of a project and then their employees/contractors another part. Hence it is tricky putting together a system that allows WORKetc customers to turn on and off project subsets at a customer level and have that different for every customer. I work with one primary subcontractor (and occasional other specialist subcontractors) as well as clients in my business. I’ve been searching for an online project management solution that would allow collaboration and interaction with clients on their particular projects. I want clients to be able to log on and see an easy-to-interpret status on their projects. They should also be able to add additional tasks and ask questions while logged in. The interface must be simple, streamlined and powerful. I like this software and would consider it over several web-based “single” or “dual” services I’m currently using and the project management web-based solution I’m currently seeking. The monthly fee is within range for my freelance business — if it meets my needs. Can it work in the manner I need with subcontractors (to whom I should be able to assign tasks with calendar and email reminders)? Can I subscribe via GCal to the milestones and events based on the person responsible for the task? Does the timesheet offer an online “timer” or punchclock option? (I currently use Cashboard for timer and invoicing and love it.) Without this, I’d have to double enter from a freestanding timer and that’s a waste of time. If it will do these things, I’ll sign up immediately! Finding a good, all around web-based office solution for web workers that collaborate with others would be a wonderful thing for my business model. Hi Naor – we have been running a pretty attractive upgrade promotion for Veetro users. Contact me at support@. Scott – thanks again for your support. @Daniel – you’re missing something here. I had a trial account in your old system. I didn’t like it, and i found out it didn’t meet my personal needs so I chose not to work with it. Yet, I did pop over once in a while to see what’s new and how things improved for me. Do you consider it as an abandoned account? But anyway abandoned accounts are no issue, you can run clean-up job \that will close all accounts not touched in a month – that’s easy. IMO for around $40 a month, without a real trial period I won’t consider to try it. Sorry folks. Great point about the abandoned accounts, I can see where needing to enter the card info would make someone do their research prior to registering, and then getting things right into process. Am really looking forward to seeing where you take WORKetc, I think it’s extremely well done. The free trial has been a contentious issue and a source of ongoing debate at WORKetc. Firstly (and a minor point really) our current merchant provider doesn’t offer a flexible enough API to take a card number and auto charge at the end of the free trial period. This is how most web services offer their free trial. To get around our payment gateway’s limitation, we needed to charge the card first off, and then offer a full refund inside of 14 days. We’ll reintroduce the free trial once we have enough volume to switch to a mainstream provider. The second issue, is that getting started with WORKetc requires a level of commitment. When we were running version 1 of the software with a free trial, we found that thousands of accounts were being created, but little follow through to actually spend the time understanding and using the software. What we are finding now is that once a person is committed to entering their credit card details, they are committed to spending time learning the software and customizing/uploading data. Certainly a specialized app might be more appropriate for some users – this certainly won’t be the best choice for everyone. I too was surprised at the lack of a free trial – they are fairly ubiquitous for a web service these days. I think the concept of a unified system for the web worker is great in principle, although the status quo will probably always be that the best individual apps will outweigh the unified approach. As for this particular example, the lack of a free trial seems a little weak. It’s a big commitment to switch systems like this, and without the cost-free option to run this system in parallel with any existing one(s) for a balanced comparison, I will be sitting it out for a while.